‘There is definitely some weird stuff going on in terms of followers,’ one social media analytics expert said. An overwhelming number of the Twitter followers President Donald Trump has gained in recent months appear to be fake or inactive accounts, experts say. In fact, at least 900,000 fake or inactive accounts followed Trump in May, according to SocialRank, a social media analytics firm. Even in the last week, the number of fake accounts filling up the president’s Twitter followers list has spiked. On May 24, Trump had 30.4 million followers, according to an achieved version of his Twitter account. Since then, that number has ballooned to over 31 million. While Trump is known be fond of the size of people following him, and to be quite popular among his supporters on Twitter, there are some suspicious characteristics among the followers he has amassed recently. 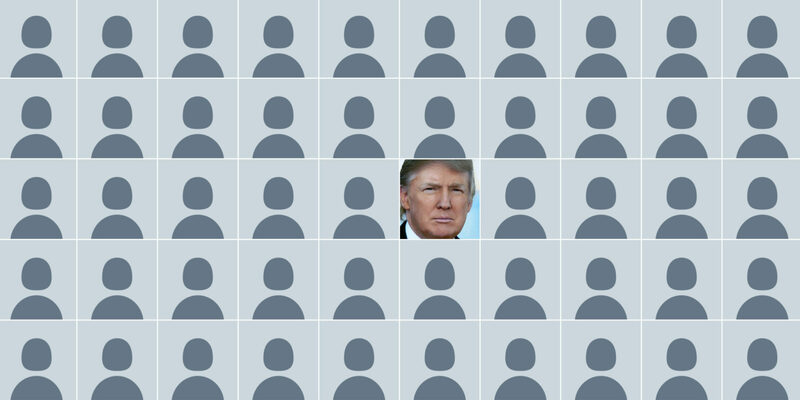 A quick scroll through Trump’s most recent followers shows that many of them appear to have the standard human silhouette photo (previously a Twitter egg) and share similarities in the number of followers, tweets, and lack of profile pictures. A large number of the new followers have between 15 and 25 followers and have yet to tweet or have begun to tweet a small number on nonsensical posts. Other accounts that have followed Trump haven’t tweeted in years and have an extremely low follower numbers. A totally real new follower of Trump on Twitter. Some new followers do have pictures–but haven’t tweeted yet or haven’t tweeted in years. Many of these characteristics are hallmarks of bots or fake accounts that are run by computers, experts say. But the reasoning for recent flooding Trump’s Twitter account with bot accounts is unclear. Taub said recent data regarding Trump’s Twitter following was “astounding” and has shown a steady rise in the number of fake accounts following him. In February, Trump had 23 million followers and 5 million of those accounts (20 percent) were inactive or bots, Taub said. SocialRank’s recent analysis of Trump’s 31 million followers found that 9.1 million of those (33 percent) had no profile photos and could be considered bots or inactive. Interestingly, Taub added, 900,000 of the 9.1 million fake accounts were created this month. Twitter initially responded to a request for comment by the Daily Dot by citing a tweet calling the claim that Trump gained “5 million followers in less than 3 days” as false. Twitter did not respond to follow-up questions about the more than 500,000 fake accounts following Trump in the past week, whether the company was aware of the spike in fake users following Trump, or what Twitter’s policy is in regards to accounts getting thousands of fake followers. Twitter strictly forbids users from buying followers or interactions. Users who do so may find their accounts suspended. However, buying someone else fake Twitter followers is a tactic some use in an attempt to get their target’s account suspended, which is another possible explanation for the president’s sudden surge in fake accounts. Who else misses the colorful Twitter eggs? Taub said it is not uncommon for popular Twitter accounts to see spikes in the amount of fake accounts following them. Profiles like Trump’s are likely added to “who to follow” lists for new users or existing users looking for accounts to follow. However, Taub said, a spike like the one occurring is uncommon. A recent study from the University of Southern California and Indiana University found between 9 and 15 percent of all Twitter accounts were bots.